New Capri owner! - Need some help!! Hi All, I have finally got myself a beauty of a Capri a Mk3 85 2.0 Laser with less than 40k . The car is in beautiful condition with minimal rust well only small surface rust in certain areas. Firstly, I have the original cassette player and have spent the past two days putting all the wiring back to original. Then taking the cassette player apart replacing the drive belt and fitting a new electric Ariel. However, I’m having two 'issues'. Firstly, I get a whine through the speakers and as the engine rev increases the whine changes pitch too regardless of the radio being on or off. I suspect this to be down to a bad ground but after talking to a local audio specialist he told me this may be resolved by using suppressor caps on the distributor? I grounded the Ariel to the body of the car so doubt it is this. What would be the 'correct' way to resolve this issue? Secondly more of a question then an issue but I’m not sure if my radio picks up FM. Maybe a daft question but it’s the first time in my life I’m using an analogue radio it seems to find AM stations but nothing on the FM. I've posted a picture below of the radio I have. Am I right in saying this will not pick up FM? Other than this she just has the usual Capri issues. Cracked dash, seats have split where the grey cloth meets the plaited effect cloth, rev gauge has stopped working. Any recommendations on interior repairs in London would be appreciated. Lastly am I correct in saying the rev gauge maybe down to the green cable that comes off the coil and runs to the clocks and by checking the continuity I could solve this issue? Last edited by mk3_capri on Sat Jan 12, 2019 8:23 am, edited 1 time in total. Re: New Capri owner! - Need some help!! Welcome to the forum and congratulations on buying the car of your dreams! The radio noise definitely sounds like a suppression issue to me. I think most HT leads these days have built in suppressors, although you can get in-line ones that fit on the distributor cap. You can also get a suppressor to fit on the coil. Also yes there is a green wire coming from the coil into the back of the dash, try to adjust the wire in the back of the dash first as apparently this is more likely the culprit - let me know how you get on though, I've been putting mine off for about a year! The L button is for Longwave and the M is for mediumwave, they are both AM. The FM button is usually marked with FM, although sometimes a U was used. Early car radios didn't tend to be able to receive FM transmissions. Hi Andrew, thanks for the reply. I don't know if the HT leads have ever been changed they may even be the original from the factory believe it or not like a lot of the other parts on the car. I will look into getting some newer leads and see if this resolves the issue. Any recommendations for what leads to go with? D366Y wrote: Welcome to the forum! Hi Danny, thanks for the reply. I've tried the scrolling through with every single button pressed going back and forth through the frequency range. I manage to pick up some French radio stations from France (god knows how) but no FM. I think it may be case of the radio not being able to pick up FM. Looks like the dash will be coming apart again for the 3rd time in two weeks . Just out of curiosity if there is a break in the green wire what is the best way to fix this. Would it be to run a completely new wire or just replacing the broken section of the wire? I think I may have one of the earliest models. I don't have a 'U' button nor a 'FM' only buttons I have are 'L'/'M'. I guess this means replacing it for something a bit newer. 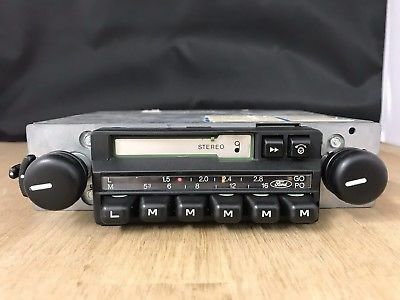 Are they any aftermarket radios that slot into the original hole or am I better of going for an original one that can receive FM? mk3_capri wrote: I think I may have one of the earliest models. I don't have a 'U' button nor a 'FM' only buttons I have are 'L'/'M'. It's up to you which stereo you fit. However, fitting a non-standard stereo will mean that you will have to trim the fascia panel for it to fit, as there are no non-standard stereos that will fit straight out the box. I wouldn't recommend you do that as uncut fascias are difficult to come by. You could, of course, buy a another fascia that has already been butchered. This particular one has been modified for MP3 connectivity, but regains the original look. It might be a good buy if that is what you are after. In any case, note the FM "U" push buttons that your radio does not have. As Andrew said, it would be much easier to get a radio like this, or buy a fascia that has already been cut up if you want to fit an aftermarket radio - original ones that haven't been cut and butchered are like hen's teeth and well sought after so no point cutting yours if it is in good knick! With regards to the green rev wire, personally I'd try patching it first if you're good with a soldering iron, but don't try patching in a small piece of an inch or something, take out a bit more (2-3 inches at least I'd say) so you have the space to move the wire easily and have enough to hold onto etc. Alternatively, get into Radio 4, which is on Longwave! You could leave the original radio in place and fit a new stereo in the glove box, it's an option that a lot of owners choose. There is even a 'mount' you can buy at Halfords to make this easier, and you may wish to buy a stereo with a remote which makes life even easier. pbar wrote: You could leave the original radio in place and fit a new stereo in the glove box, it's an option that a lot of owners choose. There is even a 'mount' you can buy at Halfords to make this easier, and you may wish to buy a stereo with a remote which makes life even easier. That radio definitely does not accept the fm signal. I do think that, out of all the options, this is the best one, especially if the original dash is still uncut. It's not that hard to do, and gives you all the options, FM, CD, MP3, etc. Im not sure whether this would have been original equipment in your car in the year it was made as by then an AM only radio would have been regarded as a very basic, entry level stuff, more 1.3 L territory. Its possible that years ago a previous owner downgraded it when they sold the car so they could put the original in their next car. Back in the day everyone was rapidly taking out AM radios and replacing them with AM/FM or AM/FM Cassette stereos. But there again back in the day everyone was cutting huge holes in their rear shelves and wondering why they started bowing and falling apart. IMHO the best way forward for you could be a modern stereo specifically designed for classic car use. It has the 2 spindles needed to fit in an uncut dash but can handle usb, bluetooth & DAB. These ones look the part and are certainly rather better to live with than an AM only mono radio.